Built in ca. 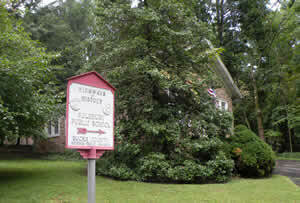 1755, the one-room schoolhouse in Solebury Village was the first schoolhouse in the township. Originally established by the Buckingham Friends Meeting, it was deeded to the public school system in 1870 and has been used for education continuously up to the present day. The schoolhouse was rebuilt in 1810 and 1870. The architectural style of the school is Federal with some Greek Revival influences. Up until the 1920s students in grades 1 through 8 attended this schoolhouse. Then from the late 20s through the 50s students in grades 1 to 3 were educated there — one teacher for all grades. In more recent years the school district used it for their school library for a while, then later for special education classes. It now houses the Historical Society’s office and extensive research library. In 1736 Samuel Eastburn purchased 250 acres of land near the center of Solebury Township, the area approximately bounded by Sugan Road, Upper York Road, Comfort Road, and Laurel Road. His parents had come from Yorkshire, England in 1713. Samuel, a blacksmith, cleared the land for farming and constructed a rough log homestead “on high ground” just east of the village of Center Hill, now known as Solebury Village. Upper York Road (Rt. 263) had been cut through in 1711, which gave the Eastburns access to the river and to Willow Grove. The property remained in the Eastburn family until 1839. The Eastburns were faithful members of Buckingham Friends Meeting and were aware of the need for schooling of their children and those from other families. Thus, Samuel sold a lot of half an acre to the meeting in 1755 for 5 shillings. It was on the southwestern corner of his tract at the junction of Sugan Road and Upper York Road. Thereon was built a stone one-room school house, said to be the oldest in continuous use in Pennsylvania. Opening in 1756, it was called the Center Hill School. The original school building of fieldstone was 21 by 33 feet, had a slate-shingled roof, with exposed rafter ends, and a stone chimney. There was an attic and a cellar and outhouses nearby. Water was carried by the older male students from a house next door on Upper York Road. A bucket with a ladle sat at the back of the room. 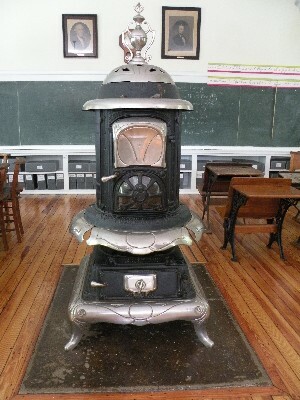 There was a wood-burning stove on a stone slab in the middle of the little room. The teacher’s desk was on a platform up front. There were rows of wooden benches for the scholars, with double desks. Grades one through eight were represented, with a few children in each grade, all supervised by the one teacher. No written tests were given. All children walked to school in almost all types of the weather, or in especially bad weather they might be driven by parents in a carriage or farm wagon. Over succeeding years, it was general policy to have a school within a mile’s walking distance of surrounding farms, but that was often a long mile. In 1806 Solebury Friends Meeting was established, an offshoot of Buckingham, and in 1812 ownership of the school was transferred to Solebury Friends for 5 shillings—again a token amount. Meanwhile, other one-room schools were established throughout the township, either by meetings or by private enterprise. Among many citizens who attended was Zebulon Pike, whose family lived in Lumberton in the late 1700s: a long walk indeed! Pike entered the army as a young man and led several expeditions to explore the southern part of the Louisiana Purchase. Pike’s Peak was named for him. Unfortunately, Pike got too close to a gunpowder explosion during the War of 1812 and was blown to bits. The elders of Solebury Friends Meeting oversaw operation of the school until 1870, when the facilities were sold for a token $1 to the Solebury Township School District, thus incorporating it into the public school system. By the early 1900s, coal was used instead of wood for heat and was stored in the basement. In 1955 students from the Bucks County Technical School renovated the building for the cost of materials ($1400). The township supervisors held their meetings there for a time. In 1959 a library for the adjacent elementary school was set up in the old school house. Dorothy Hall, sixth grade teacher, unlocked the door with a gold key. It was open for students from nine to three each day, and each class visited there twice a week. There were then four thousand books, and local mothers served half a day each to check out books and maintain order. The library was transferred to the main building in 1976. The old school building was then used for Special Education classes until the late 1990s. In recent years, it has been used for storage and kept in orderly condition. In 2007, the New Hope–Solebury School District agreed to rent the schoolhouse to the Solebury Township Historical Society for $1 per year. The Society renovated the interior, converting the space to the Society headquarters. The research materials owned by the Society were made available to the public for research. Then in 2012, the School District transferred ownership of the building to the Society, again in the amount of $1. The original Eastburn deed has a restriction allowing only educational use for the property, and the Society is dedicated to this purpose. 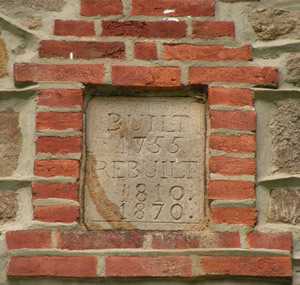 Since obtaining the schoolhouse, the Society has completed many repairs to the building. The roof has been replaced, the outside wood surfaces have been painted, the windows have been refurbished, and the interior has been realigned. Our campaign to raise money for all repairs and maintenance is ongoing. There is always more work to be done. 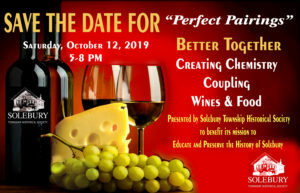 If you would like to see this Solebury treasure maintained for future generations, please consider a monetary donation to the preservation fund. Click the button below to facilitate your donation. Any amount is appreciated and will be put to use. Partially excerpted from writings by Ned Harrington.